Owner/chef Cara Stadler drops the policy, at least for now, after profits decline at Bao Bao in Portland and Tao Yuan in Brunswick, but legislation may offer another option. Erin Edwards, a server at Bao Bao Dumpling House in Portland, takes an order Wednesday evening. The restaurant on Spring Street and one in Brunswick, both owned by Cara Stadler, have reversed their no-tipping policy. Chef Cara Stadler’s experiment with a “no tipping” policy has ended nearly five months after it began at her restaurants in Portland and Brunswick. 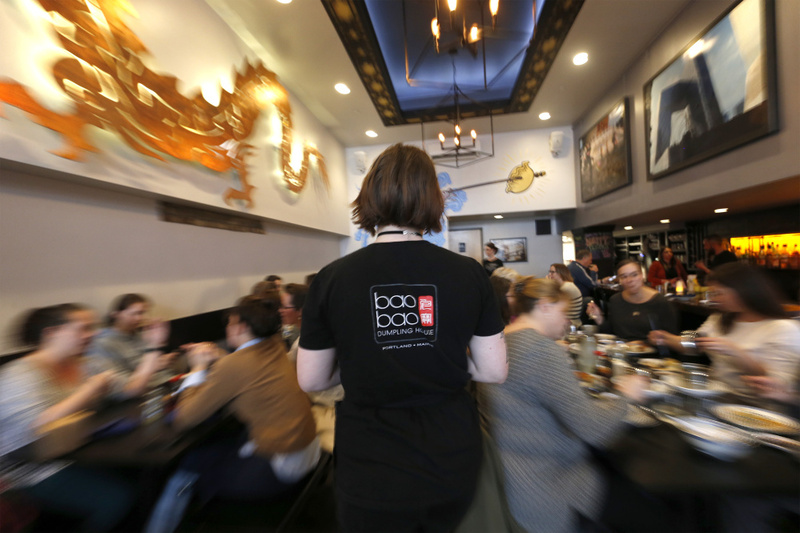 Bao Bao Dumpling House in Portland and Tao Yuan in Brunswick reversed the policy Wednesday after a review of the books for the first quarter of the year revealed it had been a failure. “We really wanted it to work,” said Chris Peterman, director of operations for the restaurants. He said customers balked at the higher prices the restaurants had to charge to make up for the higher wages paid to servers who lost tip income. Stadler announced the no-tipping policy in October, just before Maine voters approved an increase in the state’s minimum wage, which went into effect Dec. 1. The restaurant began paying servers hourly, based on experience, at a starting rate of $15 to $16 per hour. Cooks’ pay increased to $13 per hour from $12. In some cases, Peterman said, the back-of-house hourly wage increased to $14. 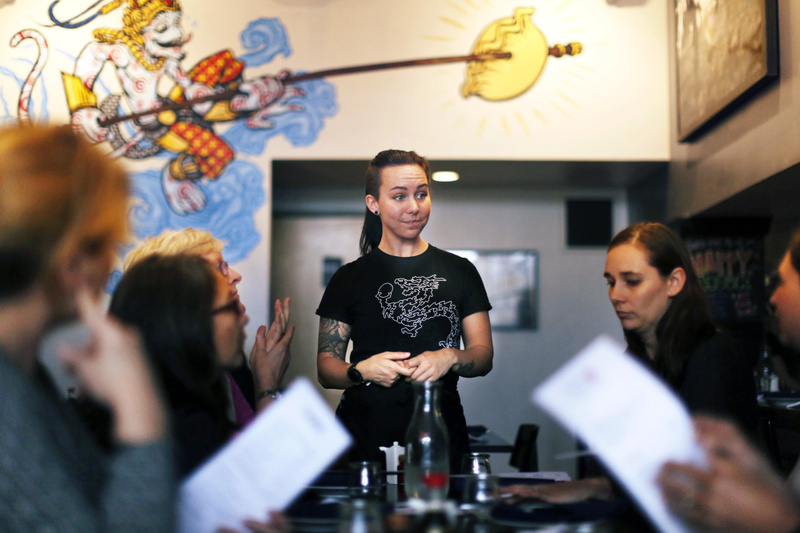 Katie Moran, a server at Bao Bao Dumpling House, checks on her tables Wednesday evening. Under the restaurant’s no-tipping policy, servers were paid hourly, based on experience, with starting pay of $15 to $16 per hour. Originally, Stadler had planned to use a service charge system allowed by federal law that would charge customers 18 percent of their pre-tax bill to cover the higher wages plus other benefits, such as paid vacation time, health care and parental leave. Then an attorney informed Stadler and Peterman that Maine’s interpretation of that law allows a service charge to be used only at banquets and special events. Maine is the only state that interprets the law that way. Chef Cara Stadler announced the no-tipping policy in October, just before voters approved an increase in the state’s minimum wage. Steve Hewins, president of the Maine Restaurant Association, said he supports any idea that will help restaurants make money, and he was not against Stadler’s plan. “So it is still an issue for many of the servers that prefer to work for tips,” he said. Julie Rabinowitz, director of policy, operations and communication at the Maine Department of Labor, said a bill that’s being drafted but hasn’t been submitted yet – it should be out next week – restores the spirit of the federal law by allowing Maine restaurants to assess a service charge. Peterman said his restaurant group would like to revisit the idea of a service charge if the Legislature changes the rules about how it’s used. A few customers noticed the price increases and posted about them on social media. Peterman said the new system helped keep servers’ pay higher during spare winter months, when snowstorms kept customers away and waitstaff would have typically brought in lower tips. 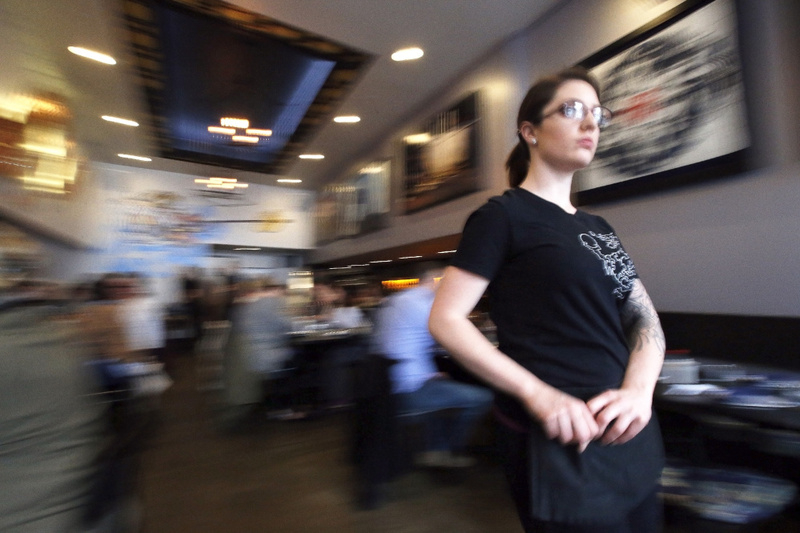 Server Delilah Necrason walks through the dining room Wednesday at Bao Bao Dumpling House in Portland. With meal prices raised because of a no-tipping policy, customers tended to spend less money. Although three employees left Tao Yuan and one or two left Bao Bao, Peterman insists there were no layoffs as profits dropped during the no-tipping period. Some employees left on their own as they usually would for different jobs, such as one server who wanted to move into a management position. The restaurants gave employees a month’s notice so they could decide whether they wanted to be a part of the new system or move on. Servers at the restaurants have gone back to the tipped minimum wage, which went up to $5 an hour this year. The back-of-house workers, which includes cooks, will keep their raises. Tao Yuan is closed until the end of the month for an unexpected kitchen repair and because Stadler is in California for a week, teaching a class at the Culinary Institute of America.